Three covered bridges, historic buildings and legendary sporting lodges remain to experience the rugged and colorful history of Pittsburg . 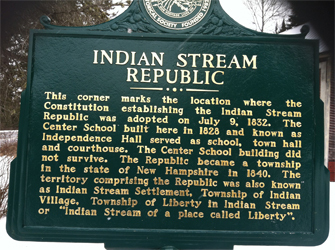 Two Historic Markers are visible from Rte 3 dedicated to the formation of the Indian Stream Republic – a sovereign nation. One is in the village center that explains the significance of the Republic. The other is 1 mile north of Pittsburg Village at the corner of Rte 3 and Hill Rd. in front of a former schoolhouse. It dedicates the location where the Republic’s constitution was adopted on July 9, 1832. From about 1829 to 1836, Pittsburg was home to the Indian Stream Republic because for nearly 60 years residents of this wild northern outpost were caught in a dispute that rendered both land titles and international boundaries uncertain. As squabbling increased among the United States and Canadian governments, NH legislators, and two companies claiming land rights, the settlers decided to take matters into their own hands. In 1832, the residents (about 300) declared themselves the independent Indian Stream Republic , establishing a constitution, a bicameral legislature, courts, laws and a militia. In 1835 “war broke out” when a leader of the Republic was arrested in Canada , then a pro-Canadian resident was arrested in the Republic, some say in retaliation. These events escalated into several more incidents, until the New Hampshire governor ordered the state militia to occupy the Indian Stream Republic . In January 1838 the British gave up their claim. The following May, the local citizens accepted New Hampshire ’s authority. 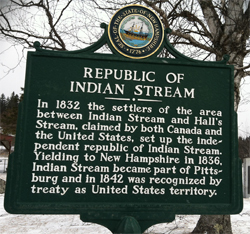 It was incorporated as the township of Pittsburg by the New Hampshire legislature in the November 1840 session. The international boundary line was recognized in 1842 with the signing of the Webster-Ashburton Treaty which was proposed by Daniel Webster, Secretary of State. Author, Daniel Doan’s, historical account of the Indian Stream Republic was published by the Dartmouth College Press. A rugged historic fictional account of the Indian Stream Republic and early settling of Pittsburg was offered in “Lost Nation”, a novel by Jeffrey Lent.